That dizzy feeling you get after reading too many social media comments. The Windswept Series considers humans interacting with each other through life and with the forces of nature. The natural event of a fire, flood, earthquake or hurricane happens suddenly, wrecks enormous havoc on a community and evokes a wide range of emotions from isolation, despair and elation of being found alive. Sometimes the chaos involves individuals or groups encountering opposing viewpoints and captures the reaction of compromise or conflict to the opposing idea. The Windswept Painting Series deals with people caught in the destruction and the challenges of rising above and beyond the destructive forces. 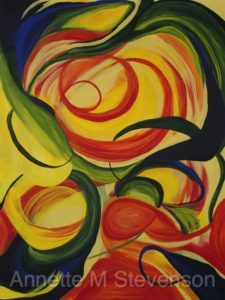 This painting titled, Circling Gossip, is the first painting in the series. ← Keep Creating-What are the differences between Oils and Acrylics?